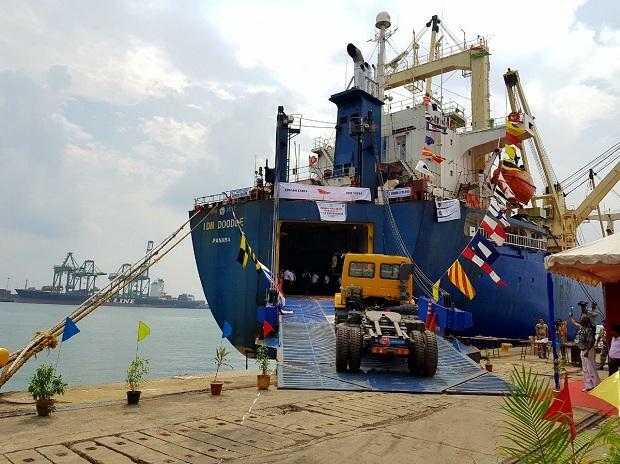 An Ashok Leyland truck loaded in IDM Doodle at Chennai Port to Bangladesh At a time when exporters are facing hurdles on the India-Bangladesh border, commercial vehicle major Ashok Leyland tested waterways to send trucks to the neighbouring country. A ship carrying 185 trucks was flagged by Union Minister for Shipping, Road Transport and Highways Nitin Gadkari from Chennai Port to Mongla Port, Bangladesh. The ship is expected to reach Mongla in five days as against 20-25 days by road. Ashok Leyland's export to Bangladesh rose to 6,000 from 500 in the last few decades. "There are problems at the border, so we have decided to explore sea which also helps in to control damages and reduce pollution ", said Ashok Leyland's Managing Director Vinod K Dasari. He declined to comment on the issues on the border. An official said that Petrapol, around 80 kilometers from Kolkata, is the nerve centre for handling business worth almost Rs 25,000 crore. Petrapol (India)-Benapole (Bangladesh) is a very important gateway for India-Bangladesh business. It is single lane and narrow, which acts as a long bottleneck for carriers. About 350 trucks are cleared from Indian side while 80 trucks come in to India from Bangladesh side, every day, through this gate which operates six days a week. Exporters say, atleast 3500 Indian trucks are waiting on any given day to cross the border. This poses a huge issue of parking of so many vehicles. Cashing in on this situation are the locals at Bongaon village, about 7 km ahead of Petrapol. Of the 3500 trucks, 2000 trucks have to wait for almost 10 days before they get parking at Petrapol. While the Bongaon municipality accommodates 1,200 trucks, rest are at the mercy of private parking lots, where contractors charge an upfront fee of about Rs 4000 for seven days. The last 5km journey to the border which should take a few hours, takes about 7-10 days. The time delay and exorbitant parking costs hits Indian exporters. In this backdrop, ALL's decision to use waterways would lead to opening up for new avenue for the exporters to send cargoes in cost effective and safe manner. A shipping company official, who transports ALL's trucks, says cost saving would be anywhere between 20-40 per cent if it moved to coastal shipping. It may be noted, in 2015, India and Bangladesh have agreed for cargo movements under coastal shipping between the two countries. Gadakari said, government first want to promote waterways, followed by railways and then roads to move cargoes. This will help to save cost, pollution and accidents.